If you’re cooking for a woman, make a good risotto and a salad. If you don’t have time to make desert you can go and buy some macaroons to have afterwards. Wolfgang Puck I made several adjustments to the recipe, but below is the original recipe my risotto took more broth 1 additional cup and I tossed in halved artichoke hearts. It didn’t seem to matter in the end that I used frozen beans and peas. A swirl of mascarpone and parmesan were my favorite last two ingredients, a bit more flavorful and creaminess. I didn’t add the chicken sausages either cuz we were having ribs! Heat the olive oil in a medium sauté pan over medium-high heat. If using the sausage add to the pan and cook until the pieces begin to brown, about 4 minutes. Transfer the sausage to the slow cooker. Add the rice, onion, celery, garlic, tomatoes, red pepper, peas, salt, vermouth, chicken broth, the saffron, rubbing it between your fingers to break it up a bit, and the green beans. 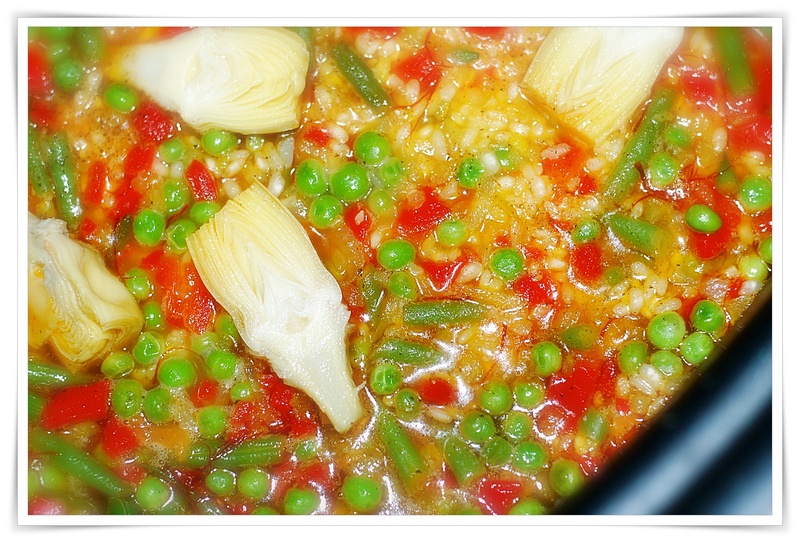 Stir gently to combine all of the ingredients, cover and cook on low for 4 hours, until the rice and vegetables are tender. Uncover, sprinkle with the smoked paprika and parsley, and serve.